Mike Dozier (left) and Kim Lindsay. 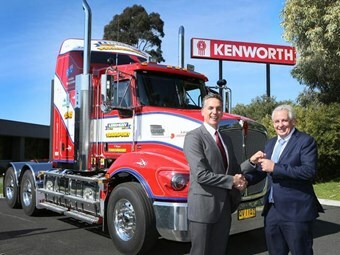 Lindsay Transport and Kenworth are celebrating the 300th Australian-made Kenworth truck to pass between the two in an ongoing relationship dating back 44 years. Operating a fleet with over 250 prime movers out of 33 stores and depots between Adelaide and Mareeba, Lindsay Transport has been purchasing Kenworth vehicles from the Brown and Hurley dealer group since inception. Established in 1953, with Tom Lindsay and his brother Peter began hauling bananas in trucks bought from their father, Victor, the operator’s current fleet consists of cabover and conventional models for B-double and 19-metre line-haul applications. "We have been working with PACCAR and the Brown and Hurley Group now for many years," Lindsay Australia managing director Kim Lindsay says. 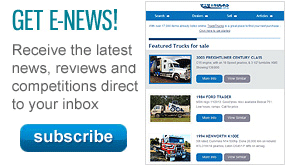 "They understand our trucking needs – and deliver outstanding sales, service and support Australia wide. "Paccar’s commitment to quality and innovation has helped Lindsay Transport to grow and maintain a large and diverse fleet so we can deliver our service promise to our customers." Built for 26-metre B-double line haul applications, the milestone Kenworth T409 will be tasked with moving refrigerated produce on interstate routes. The 300th truck is powered by a 15-litre Cummins ISX e5 engine with an Eaton Ultrashift Plus transmission, has personalised exhaust shields, a stainless steel lightbar and a specially embossed interior promoting the milestone. 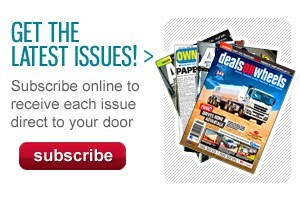 Paccar Australia’s managing director Mike Dozier says Lindsay Transport is an industry stalwart. "By helping its customers reach new markets and expand their businesses, Lindsay Australia has created a model that continually requires it to grow to meet the demand it creates. "An overarching focus on personalised service and commitment to giving back to the community are further cornerstones of their operation".